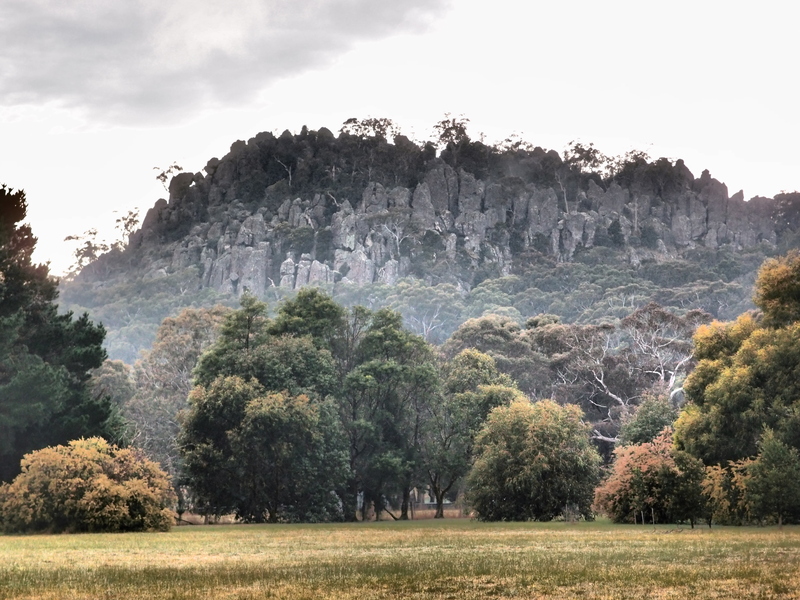 Hanging Rock is a geological anomaly near the town of Newham in central Victoria. It is set in a reserve of approximately 88 hectares. The reserve includes bushland, picnic grounds, creek, horseracing track, cafe and interpretation centre. It is home to a diverse range of animals including koalas, wallabies, possums, wedge-tailed eagles and Australia’s largest owl, the powerful owl. The Rock formed 6.25 million years ago. Thick magma squeezed from a hole in the earth. It didn’t flow, nor did it explode; it just set in place. As the magma cooled and shrunk it solidified into columns of rock. These have weathered into hundreds of pinnacles, some with strange shapes and holes. The top of the Rock is over one hundred metres above the plain it sits on. The highest visible pinnacles make up the cliff under Lover’s Leap; they are over fifty metres high. From the Rock one can see its two siblings, Camel’s Hump and Brock’s Monument. The summit has numerous spaces, crevices, tracks, dead ends and drops. Children and adults can spend hours in interesting and challenging exploration. People enjoy losing themselves on the Rock. Fortunately, finding oneself again is also easy. Apparently this was not the case for three schoolgirls who may have picnicked at Hanging Rock on St Valentine’s Day, 1900.